On Wednesday, November 7 2018, around 70 leaders working for educational equity in the DC metro area convened at a symposium for School Readiness Consulting’s Equity in Early Learning Initiative (EELI). The topic on everyone’s mind: the importance and urgency of this work. As issues of equity and social justice continue to remain at the forefront of American political and cultural discourse, EELI recognizes that high-quality early childhood education is a critical agent of change. The symposium’s opening remarks were followed by a panel discussion during which our partners from the Campagna Center and Wonders Early Learning shared a bit of what they’ve learned through their participation in the pilot year of EELI. The pilot included professional learning sessions for teachers, a community of practice for leaders from the two programs and affiliated agencies/institutions, the development of a classroom observation tool, and the creation of a family resource guide for families. The panelists emphasized the need to elevate the importance and urgency of this work as well as some of the challenges, such as the finding the right entry point when initiating conversations about race and equity with teachers from many different countries. Tammy Mann, director of the Campagna Center, stressed that “it’s really not possible to deliver high-quality services for diverse children in our programs if we’re not in touch with who they are, what their stories have been, the families they grow up in, and the communities they live in.” We agree that this is an obligation of our work. What are the most important considerations for equity-focused (leadership, teaching & learning, or family engagement)? What questions should the EELI initiative be considering in each of these areas in 2019? How might this impact or be relevant for other organizations you know of? What actions could you take around this broad work? The dialogue was robust and raised many more questions, but also encouraged each participant to make a commitment to take action. One of the symposium’s participants, Makai Kellogg even wrote a blog post sharing her experience of the event offering a unique perspective. In order for children to thrive, interruptions of inequities must be part of our work. So, what commitment to action will you make? 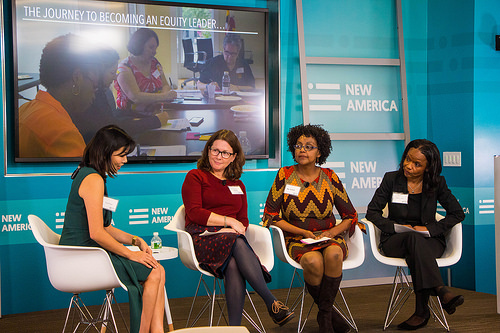 Thank you to our partners from New America, Wonders Early Learning, The Campagna Center and our sponsor, The Washington Area Women’s Foundation Early Childhood Funder’s Collaborative for helping to host Leading for Equity in Early Learning: Regional Symposium. If you missed the symposium, you can view pictures or check out the livestream recording here.